Are you suffering from your mobile phone having a poor signal strength and going flat all of the time? Have you got a metal window frame in your home, facing towards the mobile antenna? Our tests show metal window frames appear to boost the signal strength of mobile phones. Simply place your mobile phone in the bottom of the metal frame, flat against the glass and see the level of reception increase by a couple of bars. The phone only has to come out of the frame a couple of cm to lose this 'metal window frame' effect. To stop talking to the window pair a bluetooth headset to the phone or use a plugin headset. Talking to the window is not a good look! This easy solution during testing, stopped dropouts whilst using the phone as a mobile hotspot and from the phone going flat quickly due to it searching for a signal all the time. This solution may not work for everyone, but is definitely worth a try before looking for another phone, or simply giving up on the idea of a mobile phone, when in certain country areas of Australia. Our tests used aluminium window frames [1980 style] where we placed a wooden dowel horizontally in the base of the frame, to keep the phones against the glass. This keeps the phone more usable in the side position. 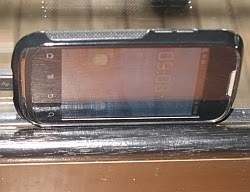 Phones tested were an LG TU550 [Telstra Blue Tick] on the Telstra Next G network and a Huawei Sonic on the Optus network. The Huawei showed the greatest improvement in signal strength and this is most likely due to the test location being on the edge of the Optus signal. Testing proved no dropouts during a 72 hour period when using the Huawei as a portable hotspot and good phone call quality, compared to normal where the call dropped out. If the above works for you, why not leave a comment on this blogpost, or one of our social network accounts, listed at the bottom of this blog.